The Quain's and the Glory Years. Cratloe's reformation in 1933 was greatly influenced by three things. The arrival into the parish of the Kennedy brothers, the return of Jack Keyes and Tom Considine, who, after the lapse in '28 hurled with a neighbouring club, Tradaree, and the rise of a new breed of talent within Cratloe. It was at this time that three young brothers were first beginning to don the famous blue and white. In doing so they brought a new dimension to hurling in the parish and were to subsequently go on and all distinguish themselves wearing the Saffron and Blue of Clare. They were the Quain's. With brothers Dan and P.J, a hurling trio fine. He put away his loved caman, the whistle to pursue. Cratloe's Mick clashed with all the stars, in hurling days of yore. From 'Mick Quain' by C. Mac Gearailt. "Mick the Miller", as he was often referred to by Micheal O' Hehir, plus his team-mates were part of what was undoubtedly to date Cratloe's finest era on the hurling sod. His brother P.J was equally one of the parishes most famed sons and hurled with Clare for a fourteen year period from 1936 ~ 1949 representing Munster on four occasions and winning two Railway Cups alongside Mick Mackey and Christy Ring. 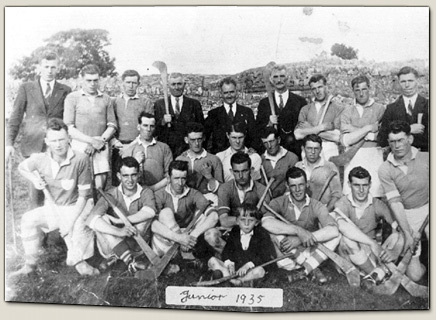 With such talent Cratloe claimed its first major silverware in 1935 when they were crowned Junior County Champions defeating Mountshannon in Kilkishen. To add to the achievement they did so without the services of Mick Quain and Bill Kennedy both sidelined with hand injuries. Brass bands and the County fair! The Green and White Brigade!